The fundraiser will build on efforts from 2017 where more than 2,000 people were served and nearly $64,000 raised in support of local food programs. This year marks a milestone anniversary for local nonprofit Milwaukee Empty Bowls. The organization celebrates 20 years at its annual fundraiser taking place Sunday, October 14, 2018 at the Kern Center on the Milwaukee School of Engineering (MSOE) campus. 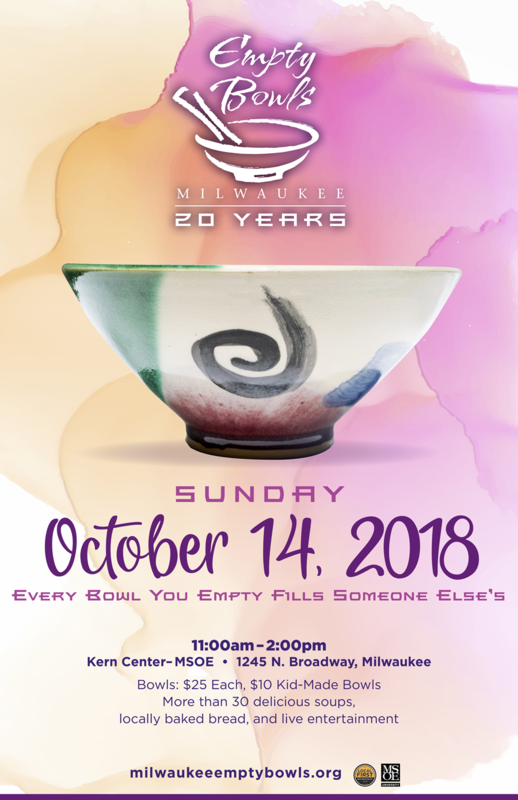 Milwaukee Empty Bowls is a 100 percent volunteer-driven effort that brings the community together to enjoy the work of area artists, soup from more than 30 restaurants, freshly baked bread, beer, kids’ activities, and live music. Guests are invited to choose from nearly 2,500 handcrafted bowls, with proceeds benefitting agencies that address food insecurity. Since 1999, Milwaukee Empty Bowls has distributed $756,630 to help feed those in need in the Milwaukee metro area. The fundraiser will build on efforts from 2017 where more than 2,000 people were served and nearly $64,000 raised in support of local food programs. With the involvement and support of signature sponsor MSOE, local businesses, and 300 volunteers, more than 95 percent of the funds raised at this year’s event will benefit the following agencies: Fondy Food Center, Groundwork Milwaukee, the Jewish Community Center, Just One More Ministry, Milwaukee Christian Center, and Milwaukee Rescue Mission. 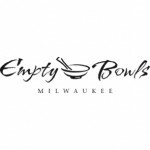 Milwaukee Empty Bowls’ 20th annual fundraiser will include beer from Lakefront Brewery and Sprecher Brewery as well as limited-edition handmade ceramic mugs and stainless steel soup spoons hand-stamped with the Milwaukee Empty Bowls logo. Attendees can purchase raffle tickets to win a variety of prizes donated by local businesses. Milwaukee Empty Bowls t-shirts and sweatshirts, and bowl-themed items donated by the returning West Suburban Quilter’s Guild are also for sale. Since Milwaukee Empty Bowls’ inception, more than 27,000 bowls have been purchased. Guests take their bowls home to serve as a reminder that someone’s bowl is always empty. * All bowl purchases include 2 soup tickets. Additional soup tickets available for $2 each. Free parking is available in the Viets Field structure below the athletic field. Milwaukee Empty Bowls engages the community through ceramic and culinary arts to raise hunger awareness and provide resources to local agencies addressing food insecurity. For more information, please visit www.milwaukeeemptybowls.org or the Milwaukee Empty Bowls Facebook Event page. Proceeds benefit Milwaukee area programs working to address food insecurity. Since 1999, Milwaukee Empty Bowls has donated $637,630 to help feed those in need in the Milwaukee area.